"Seven Oaks," oldest estate property in Snedens Landing on the market for the first time in 42 years. Loved and cherished by current owners for its romantic style and bucolic setting. 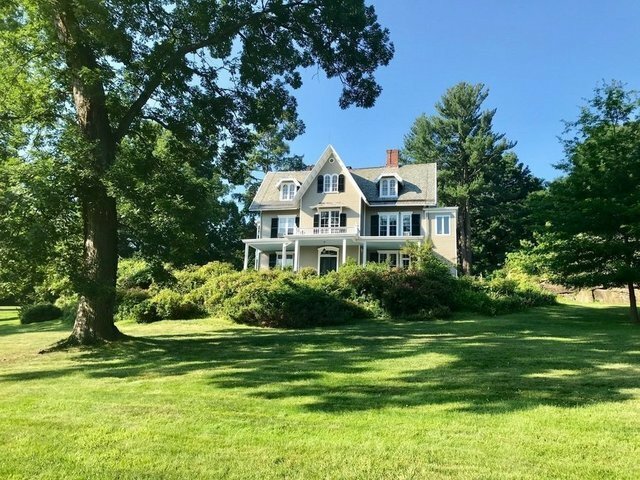 Seven Oaks is a 8,000 sf Gothic Revival style home on 2.29 acres in a private setting, with beautiful gardens, large in ground pool and two original outbuildings. Its architectural distinction intrigues the viewer and relaxes the mind. Seven Oaks was built in 1862 and is situated on the crest of a great lawn accompanied by several old oak trees and towers over the landscape. It is defined by a steeply pitched cross gable slate roof with large decorative dormers, huge wrap around veranda and three story bay window on its east side. Interior features include huge oversized landings on all three levels, tall ceilings, decorative moldings and panel doors, oversized windows, 12 fireplaces, a sun porch and much more. There are peeks of the Hudson River from the upper floors. Step back into time as a respite to the 21st century. 25 minutes to New York City. Adjoining two acre parcel also available for sale - see MLS #4830331.